Sitting in front of your television watching The National or an episode from The Detectives, you may not realize that the communications system that makes possible CBC’s broadcast is from a Canadian company, which started with just one man in late 2001. As with many successful global companies that began with one individual, Brent Perrott, at the turn of the 21st century, noticed a niche in the satellite market that was not being satisfied. Back then, he observed that many companies lacked a dedicated staff to analyze and procure satellite capacity. “This caused companies to make decisions that were not as optimal or competitive as they should have been,” Perrott said. With this mindset, he founded Hunter Communications to fill that need. For the first two years, Perrott was the sole employee, but the business grew over the years to become the global presence it is today. As the president and founder of Hunter Communications, Brent Perrott spearheads his company in providing satellite communications services to government contractors, enterprise and telephone companies for mobile, and remote voice and internet connectivity. In 2015, Perrott’s company launched the Hunter Canada Ku-beam, a new Ku-band payload on the E115WB satellite, which is one of more than 2,000 communications satellites that are encircling the Earth providing means of communication for both private and public sector organizations. Satellites play a critical part in the communications infrastructure in television, telephone, radio, internet and military applications. Based on these factors, Hunter Communications was awarded a 7-year contract in February this year, to provide Satellite Space Segment Services to CBC/Radio-Canada. By utilizing the Hunter Canada Ku-beam and a C-band beam with its partner Intelsat, CBC/Radio-Canada has more transmission throughput and the ability to use smaller antennas that are easier to move to remote transmission sites. “This satellite capacity is a critical component of CBC’s infrastructure,” said Perrott. “Our satellite beam is being used to distribute the CBC’s audio and video signals across all of Canada. It is the backbone to ensure all Canadians receive their national programming.” Through this service, the broadcast signals and bi-directional IP communication services of CBC are being transmitted on the 54 MHz Ku-band and 36 MHz C-band capacity. This complements CBC’s terrestrial fibre network and further supports its North American and foreign bureaus. Perrott added that for the CBC, this primarily is a solution that revolves around higher signal strength and a lower cost. “For CBC, the satellite infrastructure to broadcast the signal to all Canadians is critical, but the real benefit is that every dollar they save on their satellite costs translates to a dollar they will use to deliver more and better content to Canadians,” he said. The Hunter Ku-beam also has several key technical advantages for other industries. With its higher power focus in the far North, Hunter can provide communications for airplanes, boats and communities throughout the length and breadth of Canada. Hunter’s capability is being used in “nearly all aircraft flying over Canadian airspace – that includes a lot of international-flagged airlines – to deliver internet to passengers,” Perrott pointed out. He went on to explain that Hunter also provides critical communications to ships in the Northwest Passage up to Resolute Bay and beyond. “We’ve provided demonstration services to the Army Rangers and hope to ultimately provide service for every branch of the Canadian military and civilian agencies,” he said. He went on to stress how their service can also benefit the military. He explained that any branch of the military can now access high-speed broadband as far north as 80 degrees north latitude using antennas as small as 29cm and at much higher speeds than before. “That’s what we’re doing today with every airplane going over Canadian airspace. That can equally be applied to every Coast Guard vessel or military outpost.” With more companies getting into the satellite communications space, the military will have more options to provide bandwidth at lower cost. 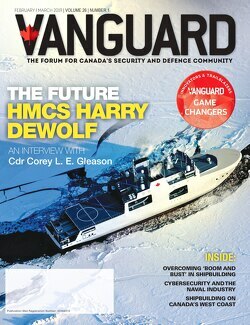 “Every branch of the military is hungry, even desperate, for more bandwidth. It’s critical to provide that if our armed forces are to remain effective in securing our borders,” he said. As with any business, there are always challenges. In providing any service that operates on a 24/7 basis, there is invariably the challenge of rendering uninterrupted service to customers. “But due to the benefits that satellites bring to all Canadian citizens, we work tirelessly to provide such a service. The general public though is often unaware of the integral role that satellites play in their lives,” he pointed out. From aiding navigation on Google Maps and GPS to receiving our latest shows on television, communications satellites play an important role. Many remote communities use satellites as their life-line; sea-going vessels and every aircraft – whether military, coast guard or civilian – all rely on satellite communications. It is also a critical component for many companies in tracking assets, providing real-time data transfer, and for morale and welfare services for remote employees. Even when we are at our most vulnerable point following a disaster, satellites are typically the first line of communications to be employed. New advancements in antenna technology will allow us to install small mobile antennas. Today we see that occurring in the commercial airline industry where WiFi is being rolled out. Perrott predicts that within the next decade, we can expect nearly every plane, bus, train and car to be outfitted with these small, inexpensive antennas to allow satellite delivery on the move. “Being entrusted by a flagship broadcasting station in Canada like CBC to deliver its content… we couldn’t be prouder to have been chosen,” he said. To learn more about Hunter Communications, a company that been providing satellite solutions for government, energy, maritime and aeronautical sectors since 2001, visit huntercomm.net. Game Changer: Brent Perrott, Hunter Communications Inc.